When arrival you will find Egypt Holiday Packages representative by Egypttravelcc tours for meet & assist service through the arrival formalities, then you will be transferred to you hotel by A/C car and start your Pyramids and Old Cairo Tour Package. The Egyptian Museum, where u can see 250,000 genuine artifacts on display the largest most precious collection of Egyptian art in the world. Then visit Great Pyramid – Cheops, Chephren & Mykerions. Where you will see the only standing wonder for the ancient world. Then proceed to Sphinx the mysterious monument which have human face and lion’s body. Then continue to Khan El Khalili Bazaars. Shops in this district are legendary for fine border brassware, copper, perfumes, leather, silver, gold, antiques. The step Pyramid of Sakkara Followed by a visit to The Pyramids of Unas & Oser-Kaf the Mastaba. Tomb of Mereruka, Ti & Pta-Hotep. Then continue to Old Cairo, visit The Church of Abu-Sergah and St. Barbara, The Hanging Church, and we will also visit The Old Jewish Synagogue Ben Ezra Synagogue. Entrance fees ticket inside the great pyramids and mummy room Egyptian museum. Riding camel or horse around the Giza desert pyramids . 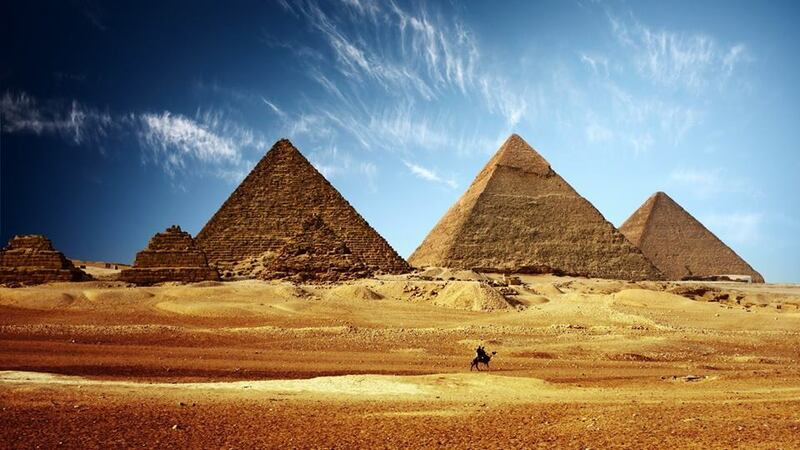 We hope that you will enjoy your Pyramids and Old Cairo Tour Package.